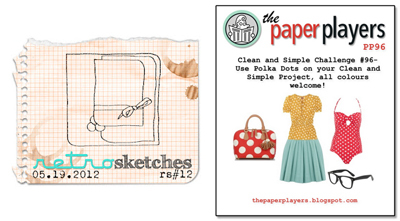 I love polka dots so when I saw this weeks challenge over at The Paper Players I was so excited. A few weeks ago I made this card and loved how the flowers turned out. I decided to do them again but change up the color some..thanks to the advice of my daughter. By the way, she just created a new blog..you should check it out here. She would love it if you stopped by. I also used this weeks sketch from retro sketches. I gently ran my finger along the flower petals to give them a little curve and also put a light fold in the leaves. After I stamped the sentiment I used my pen and drew a couple of lines under it. I attached the flowers and the white panel to the card with my dots. Love this card. The colors are great, and I remember loving the original you based this one on. I've never heard of that challenge you mentioned, but anything with polka dots sounds good to me, too. Deanna this card is so gorgeous, the colours are beautiful and the flowers fabulous. I happened upon that same embossing folder a few months back and I love the great big dots. Deanna, Deanna, Deanna - I am SO THANKFUL every day to know & be inspired by you! I really love this, it;s gorgeous! Thank you so much for playing along with us at RetroSketches this week! Stunning Deanna, I am in love with the layout and all those striking polka dots, hugs! Oh wow! This is so beautiful. I love how uplifing this card is. Never mind your impeccable crafting (Don't worry, I am only half jealous). ;-) Stellar color combo too. Very fresh, indeed. Brava! This is gorgeous! Love the color combination and all the texture with the different size polka dots is awesome. OUTSTANDING card in every way Deanna! LOVE, LOVE, LOVE it! So glad you played RetroSketches this week! This is gorgeous! I love the colors and everything about it! This card is FABULOUS! I love everything about it! Thanks for playing along at RetroSketches! So sweet....someone else used that EF and now I want it even more! Love the colors! Thanks for playing with the Paper Players and sharing this precious creation! Now off to check out your DD's blog! So Fun! I love it! beautiful details. I am speechless over this beauty!! Love your take on the sketch--that skinny piece of aqua is the perfect touch and ties it all together. Your flowers are stunning! I am delighted you shared such a beautiful creation with us at The Paper Players! So beautiful and what I really love is how you layered the paper for the flowers, just so clever. I will be pinning this one for sure! so pretty and polka dotty! Love your card! The flowers are precious! And I love the polka dot embossing too! Classy!!! Deanna, this is gorgeous card. Love the polka dotted flowers and the double underline under the sentiment. Great take on the sketch element. Thank you too for the lovely comments you've been leaving on my blog. They're greatly appreciated. This card is absolutely gorgeous Deanna. I LOVE those flowers and those polka dotted leaves. Thanks for playing along with us at the Paper Players! I love everything about this card! Love the layered flowers and the polka dot theme:). TFS! 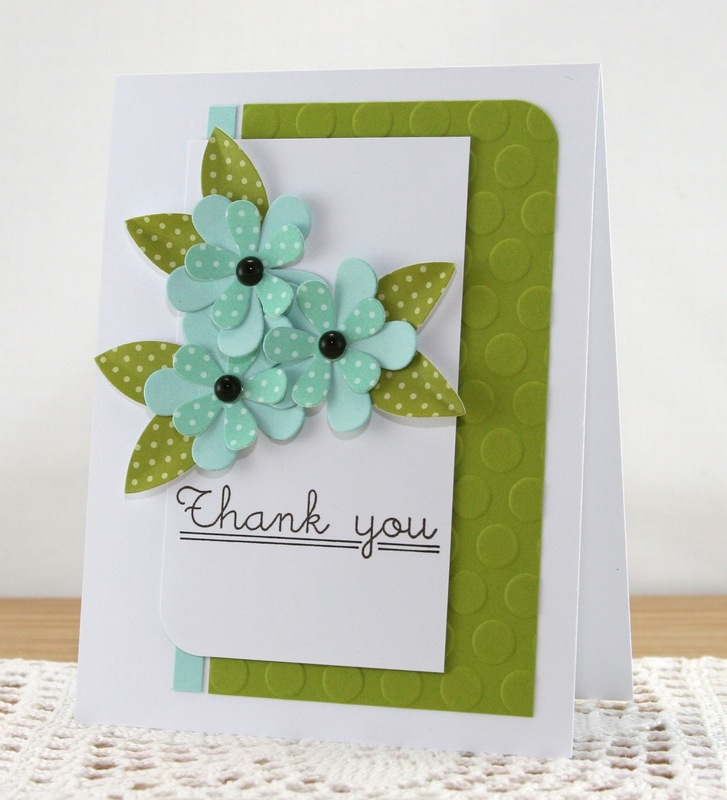 Your dotty card is just stunning Deanna! I love the colours and how you added a blue strip to the green embossed background. Deanna, your card is just so perfect! I love the simple, clean lines, the font of the sentiment, and simply beauty of those colors together! The flowers are darling, and the polka dot embossing folder helps pull it all together! Great card. TFS. Gorgeous! You have such a beautiful way of creating CAS cards that are so pleasing to the eye and this one definitely does not disappoint! So glad you joined in the fun with polka dots this week! The embossed layer is perfect. The 3-d flowers are just fab!